I can't quite read these but they look very pretty and interesting. Smashing, bright and happy colours and a lovely verse. These are such fun - and all the buttons are great. Oh some more nice fresh looking ones. Very bright and cheery but I can't read the verse either. happy to get any of them. 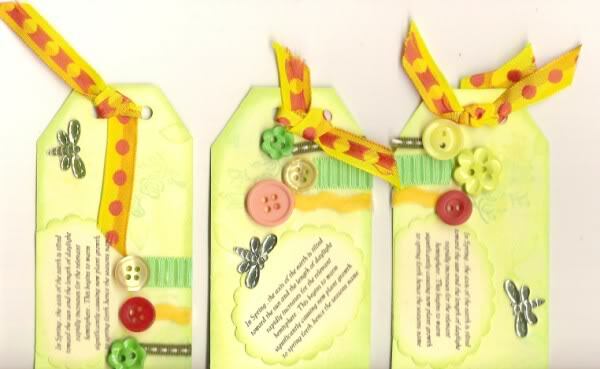 Lovely tags, they really are fresh looking. I like these. Lovely and bright, Kim. Happy buttons and bows set. All very nice. Very nice Nona. Like the buttons. Love these kim, more buttons! 'In Spring, the axis of the earth is tilted toward the sun and the length of daylight rapidly increases for the relevant hemisphere. This begins to warm significantly, causing new plant growth to spring forth, Hence the season's name'. just happened to get on computer as you were posting.